There is a cast in the Middelheim Open Air Sculpture Museum in Antwerp. 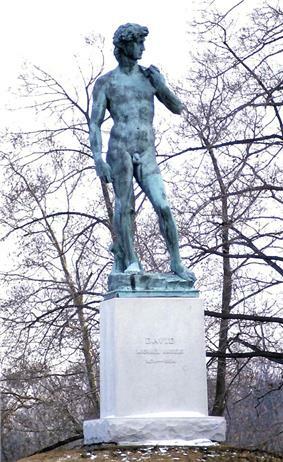 There is a full scale replica of David on the campus of California State University, Fullerton that lies broken in pieces on the ground. It was brought to campus by a professor in 1988 after it was damaged in the 1987 Whittier Narrows earthquake. Visitors often touch the remains of the sculpture for tactile study or, in a new student tradition, the dislocated but upturned buttocks for general good luck. 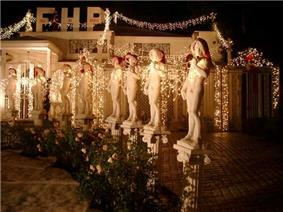 Also in southern California, a resident of the Hancock Park neighbourhood in Los Angeles has decorated his house and grounds with twenty-three reduced scale replicas of the statue. 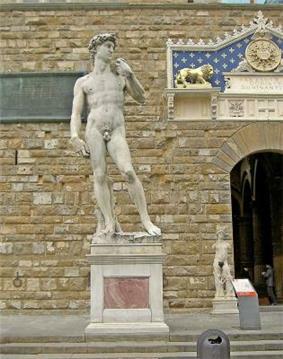 In 1995, a replica of David was offered as a gift by the municipality of Florence to the municipality of Jerusalem to mark the 3,000th anniversary of David's conquest of the city. The proposed gift evoked a storm in Jerusalem, where religious factions urged the gift be declined, because the naked figure was considered pornographic. Finally, a compromise was reached and another, fully clad replica of a different statue was donated instead. ^ "Louisville residents react to giant, gold David statue", WHAS-TV, May 2, 2012.